We all cherish those moments in life when we feel transported, when we are able to transcend the everyday and time seems to stop. There are few things in this world as life-affirming as great music. One moment it can be entertaining and fun, and the next, cathartic and renewing. We are committed to sharing the full range of music’s power in our 2018-19 season—one that promises to move the soul, with a diverse array of experiences tailored to our specific concert venues. While our RiverView Theater home is undergoing renovation, we’re excited to be presenting most of our performances this season at First Baptist Church in Shreveport—one of the most architecturally beautiful and acoustically perfect venues in our region. In addition to the gorgeous space, we’ll be making good use of the visual enhancement opportunities that abound, projecting live images of soloists, conductors and orchestra musicians on the walls behind the stage to help create a sense of being “inside” the orchestra. 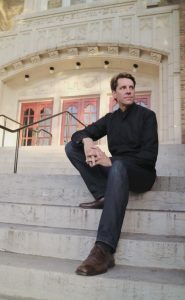 Once again, we are excited to present all-time favorites from composers like Beethoven, Mozart, Bach, Elgar, and Mussorgsky along with new works from composers like Tan Dun (Academy Award winner), Jennifer Higdon (Grammy Award winner) and the incomparable Philip Glass (one of this year’s Kennedy Center honorees). We’re especially pleased to be sharing a piano concerto by Glass, which was co-commissioned by the SSO, written especially for our soloist, Simone Dinnerstein. Our presentation of Higdon’s Low Brass Concerto will be the first performance in the world after those of the commissioning partners (Chicago, Philadelphia and Baltimore symphonies). For me, the season highlight is unquestionably our performance of Bach’s monumental St. Matthew Passion on Palm Sunday. With multiple choirs and world-class soloists, our unique semi-staged presentation will bring the work’s dramatic intensity to life. I promise that you will experience something truly impactful and memorable. Of course, we are committed to presenting the widest range of great orchestral music and are thrilled to welcome Broadway sensations Ashley Brown (the original Mary Poppins) and two-time Tony Award-winner Brian Stokes Mitchell. We’ll also celebrate the music and legacy of David Bowie, as well as Star Wars Day (“May the Fourth…”) with a Sci-Fi Spectacular to close our season. Our free Noel Foundation Chamber Music series features star players from the SSO along with guest pianists Alon Goldstein, Simone Dinnerstein and Mei Li. We’ll be celebrating the 50th anniversary of the moon landing with a “Reach for the Stars” Discovery concert for thousands of elementary school students, in addition to our extensive education our engagement activities in our area’s schools, libraries and nursing homes. There’s so much to hear, see and experience with your Shreveport Symphony this season. Every concert promises a new discovery, a fresh perspective, a spiritual renewal. Thank you for being part of our musical journey as we affirm the power with which music moves the soul!